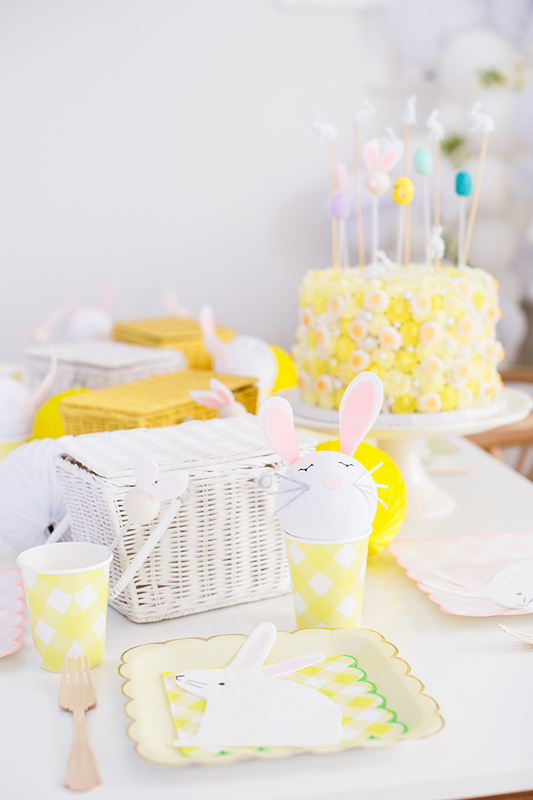 With Easter coming up, we wanted to provide some party inspiration to help you celebrate with your little bunnies. 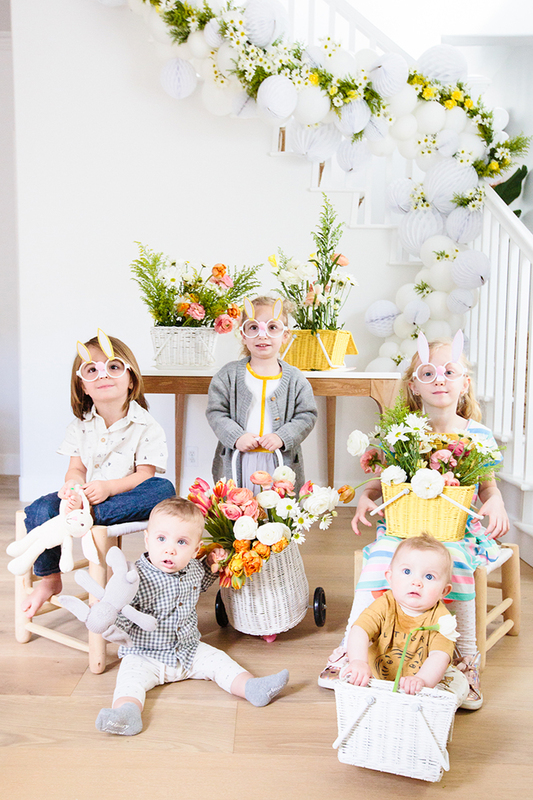 This adorable Easter kids party comes to you courtesy of our gals Rachel of Bonjour Fête and Royale of But First, Party! 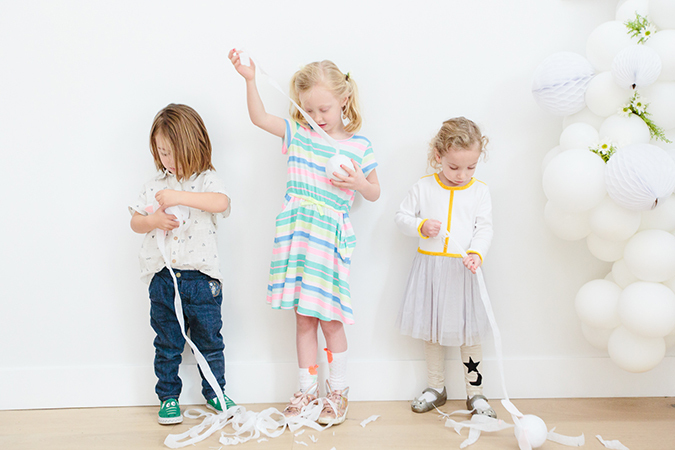 (you might remember them from this adorable Valentine’s Day play date). We’ll hand it off Royale from here, who will tell you all of the details! Hi, everyone! It’s Royale from But First, Party! 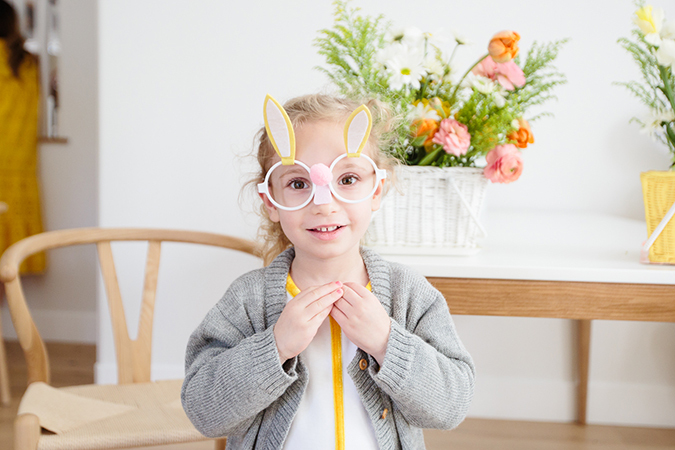 When Rachel and I were planning for our Easter play date this year, we let the party ware speak to us, as we often do. And it screamed bunnies. And yellow. And more yellow! 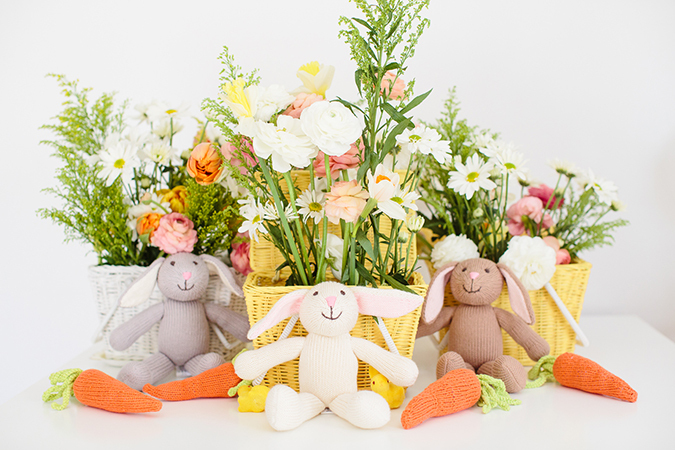 (Don’t worry, we still snuck in a little pastel pink—bunnies have noses after all.) 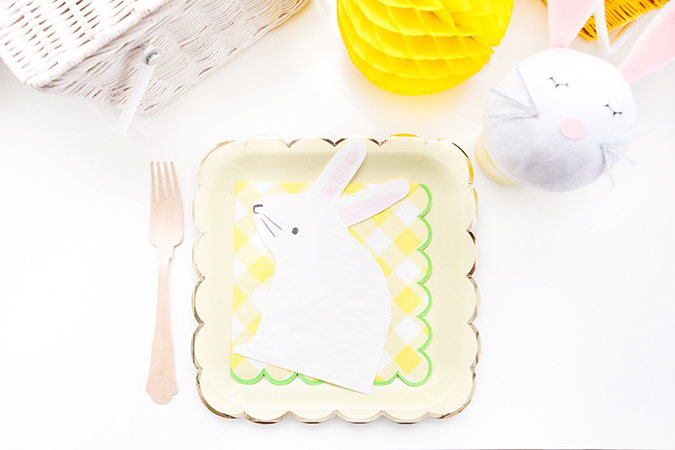 We started with the die-cut bunny napkin, which had us hopping up and down with excitement—die-cut party goods are really having a moment, and it’s easy to see why. 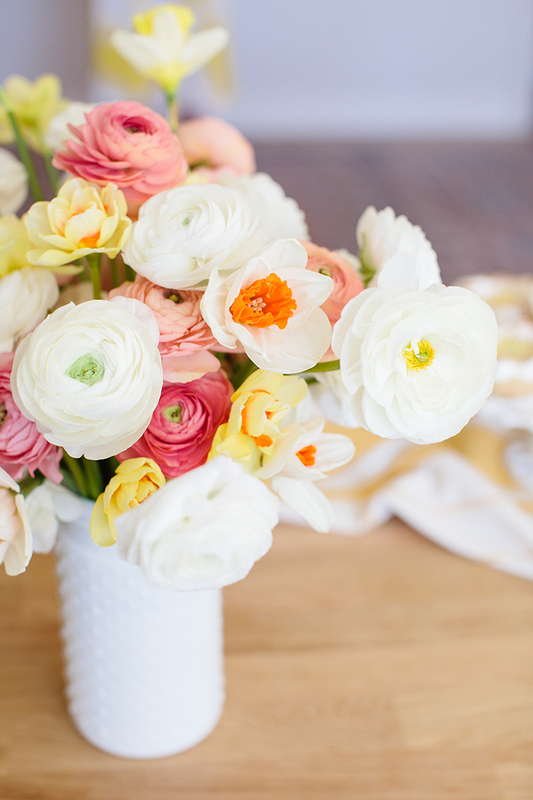 Next, we layered in some of the pale pink and yellow gingham plates and cups, for a classic meets modern feel. 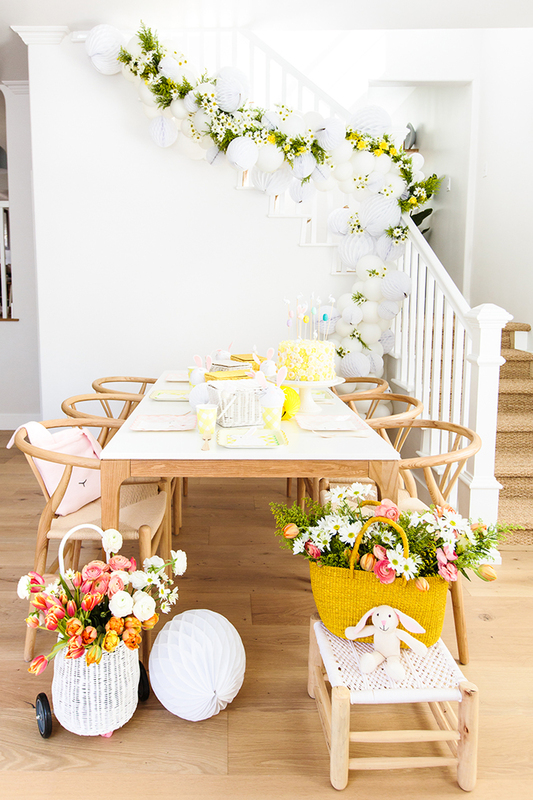 To complete the perfect place setting, we popped bunny stir sticks and surprise balls in the cups. 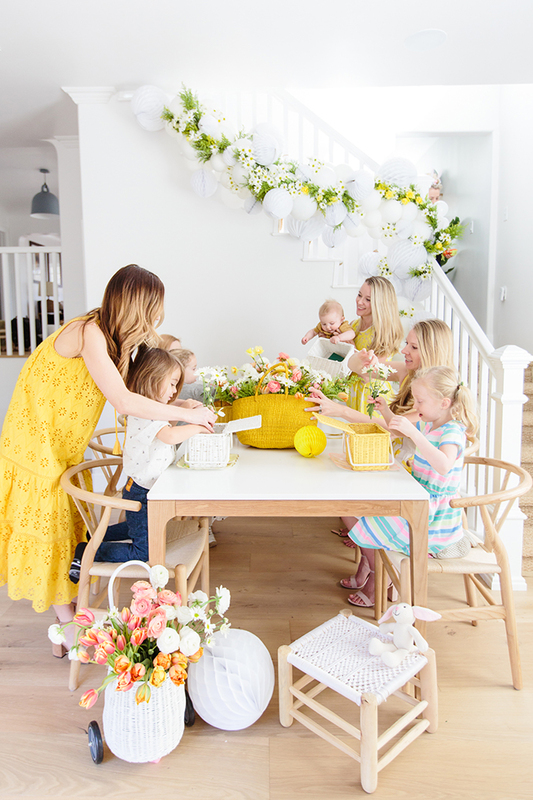 Finally, we finished the tablescape with a “runner” of yellow and white mini picnic baskets and honeycombs. For interest behind the table, Rachel and I created a honeycomb garland on the banister of my staircase. I have been dying to do this ever since I recently redid the floors in my house, taking them from dark to light. 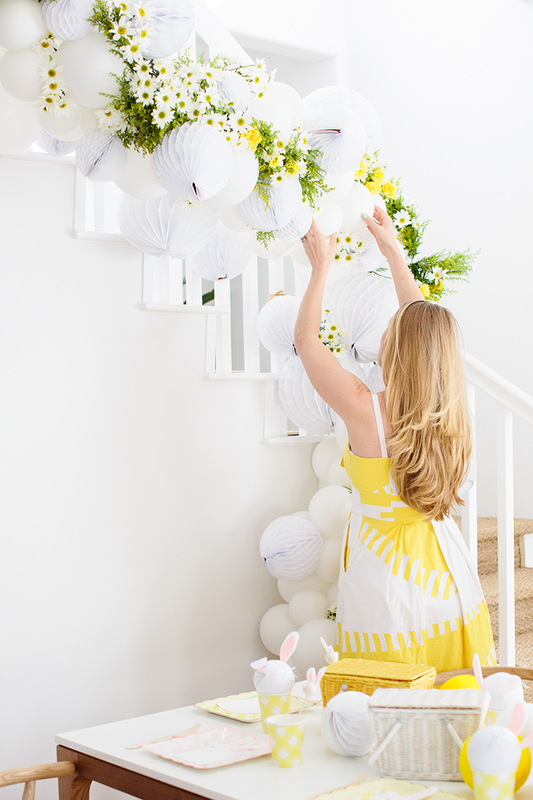 We also looked to include pops of yellow here and there, and knew our girl Dawn from Earth Baby Flowers would create the perfect floral element to complement the garland—basically a flower crown for our stairs. Daisy perfection! 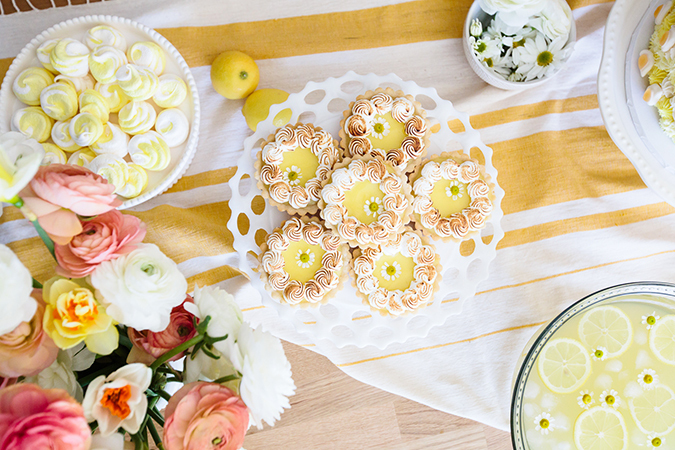 Speaking of floral perfection, we used chamomile flowers to add a little Easter extra-ness to the chamomile macarons and lemon meringue pies Lauren Lowstan made for us (recipes coming to the blog soon!). 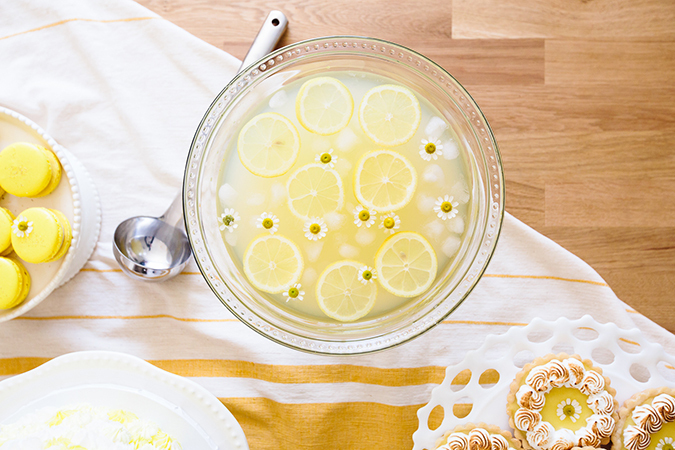 We also garnished our lemonade with the same florally goodness. Our favorite dessert, as always, was the cake. We all loved our Valentine’s Day cake with the lip gummies, so we took these gummy eggs and added them to the buttercream dollops for a bright and sunny, super fun and festive look! 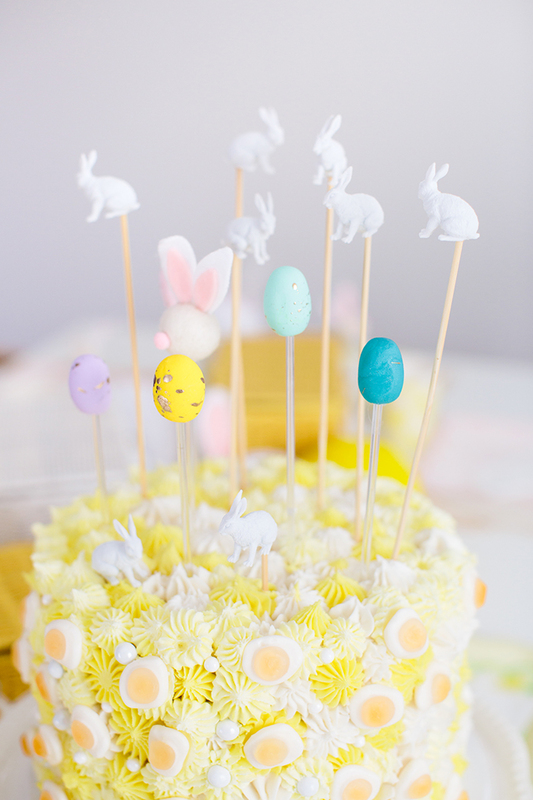 Lastly, we topped off the cake with these adorable gold speckled egg stirrers and bunny food picks! We were also super lucky to have our friends over at Lauren’s fair trade shop The Little Market send some things our way to play with. 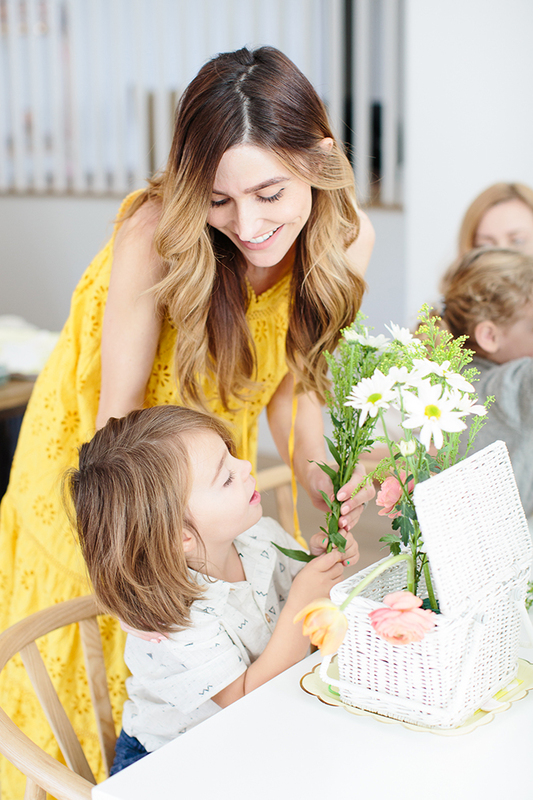 How gorgeous is this yellow striped tablecloth? 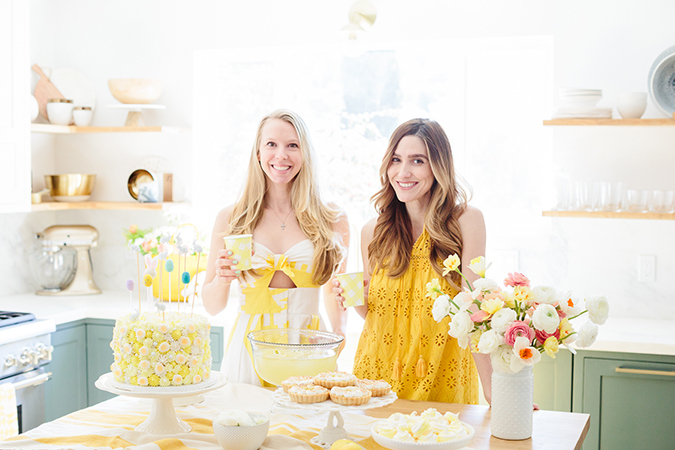 (We told you we were all about yellow this holiday!) And did you know they carry furniture too? 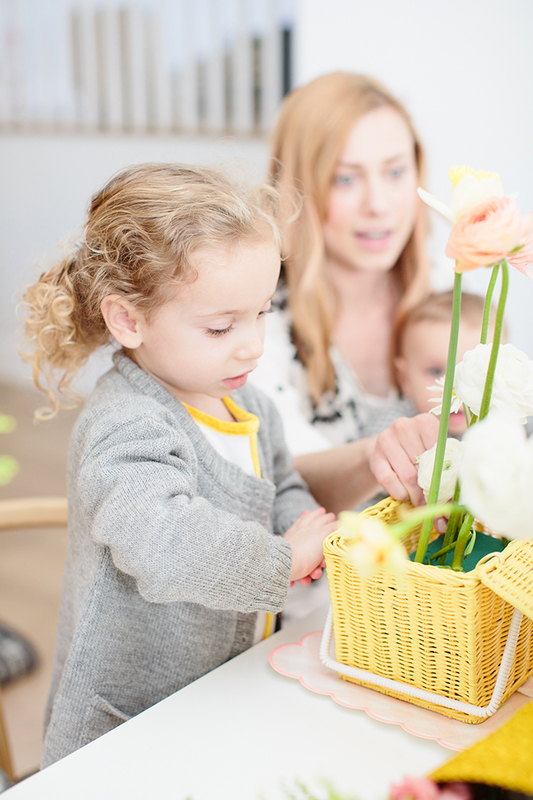 This woven stool was a perfect perch for the littles! 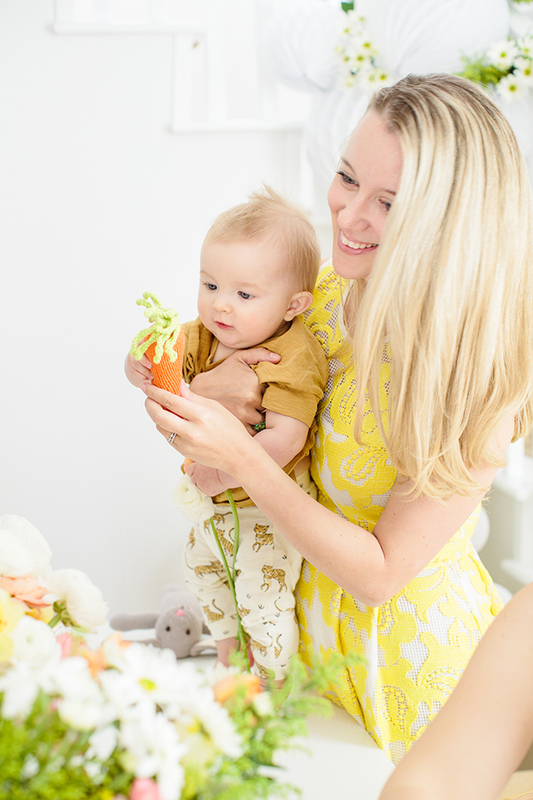 The real (hand-knit) hit of the party, as far as the babies were concerned, were the carrot rattles! 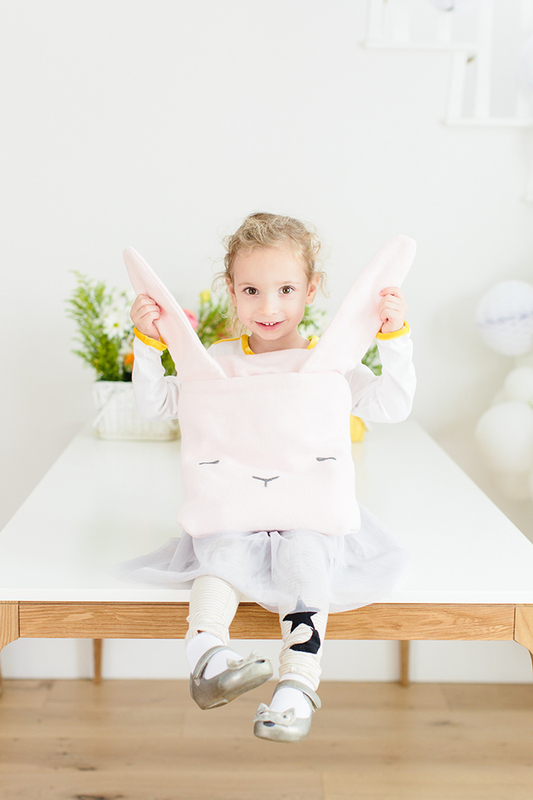 The big kids were all about the trio of bunny stuffies and this super soft organic cotton bunny blanket. 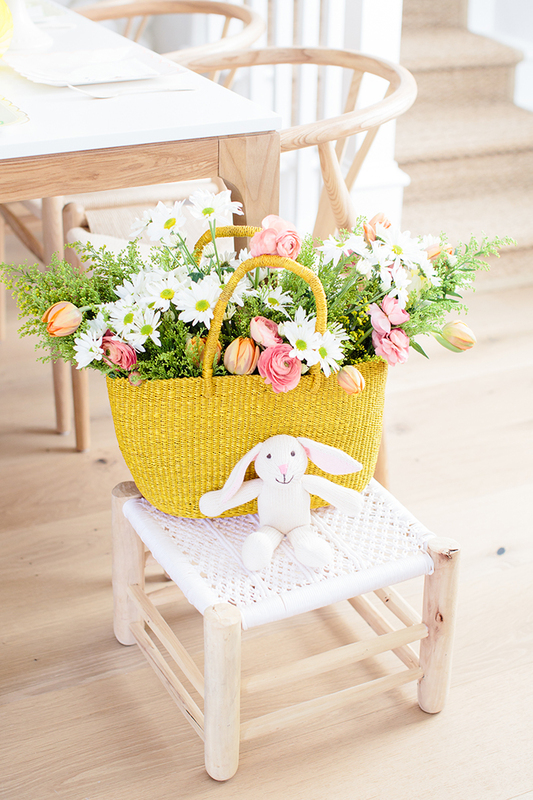 Look no further for Easter basket ideas!